With an ageing population in Northern Sydney, improvements in end-of-life care (EoLC) has been recognised as an opportunity to strengthen community-based care, improve coordination of care between existing services, improve access to and delivery of supportive resources, and reduce potentially preventable hospitalisations. A recent and well publicised report from the Grattan Institute has identified the desire for many Australians to die at home (70%) yet only 14% are able to achieve that outcome. The report also highlights that across Australia approximately 54% of people die in hospitals and 32% in residential aged care and that because most people do not speak up about the way they would like to die, they often experience a disconnected, confusing and distressing array of services, interventions and relationships with health professionals. On Wednesday 8 February 2017, Sydney North Health Network (SNHN) held an End of Life Care (EoLC) co-design workshop with around 40 participants in attendance. 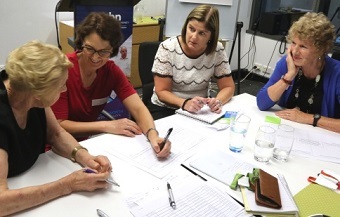 The workshop focussed on the key theme of Quality of EoLC provided in Residential Aged Care and will assist the PHN to commission services that support a better End of Life Care experience for residents and their families. The tender is expected to be released in early March.